Our PET FLEX ™ formula supplies Glucosamine, Chondroitin, Manganese and Vitamin C.
Research shows glucosamine, chondroitin and manganese can benefit your pet. 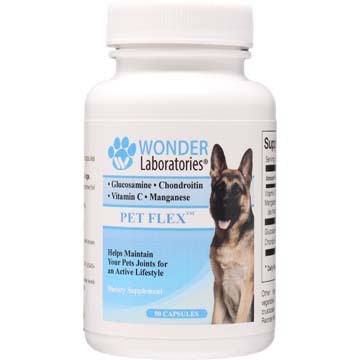 PET FLEX ™ combines these nutrients, plus Vitamin C for your pets Active Lifestyle. Contains crustacean shellfish (shrimp, crab, lobster & crayfish)ingredients. 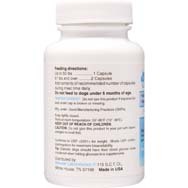 Add contents of recommended number of capsules during meal time daily. Do not feed to dogs under 6 months of age. CAUTION: Do not give this product to your pet with known allergies to shell fish. 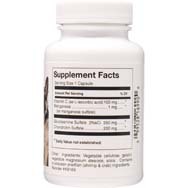 Tip: Diabetic dogs should have their blood glucose levels monitored when taking glucosamine supplements. Do Dogs Get Stressed Out?